This 4 story Fitler Square Home is a gem in the highly desired Fitler Square neighborhood. Perfectly situated a block away from the Schuylkill (Taney) Park and just at the foot of the South Street bridge leading to UPenn, CHOP, and Drexel. There is not a better location to enjoy all the benefits of Center City, with the accessibility to University City. The home features an open concept layout, with exposed brick and beams, as well as the ample lighting provided by the overhead skylight which catches your eye as you walk through the front door into the living room. Pass through the dining room as you enter the kitchen which has been completely updated with Stainless steel appliances, granite counter tops, maple cabinets, glass /slate backsplash, and a porcelain tile floor with radiant heating below, finished with a convenient granite breakfast bar. Off of the kitchen is a quaint rear outdoor area, ideal for a grilling and relaxing on your patio table. The entire home has been updated with dark hand-scraped maple hardwood floors, custom trim work and neutral yet classic freshly painted walls. Go up the open staircase to the 2nd floor, which boasts the master bedroom complete with recessed lighting, ceiling fan and his/her California-style closets, as well as an additional storage closet. As well, there is a newly remodeled custom bathroom with enclosed glass shower including porcelain floor and wall tile and stone/glass mosaic accent wall. 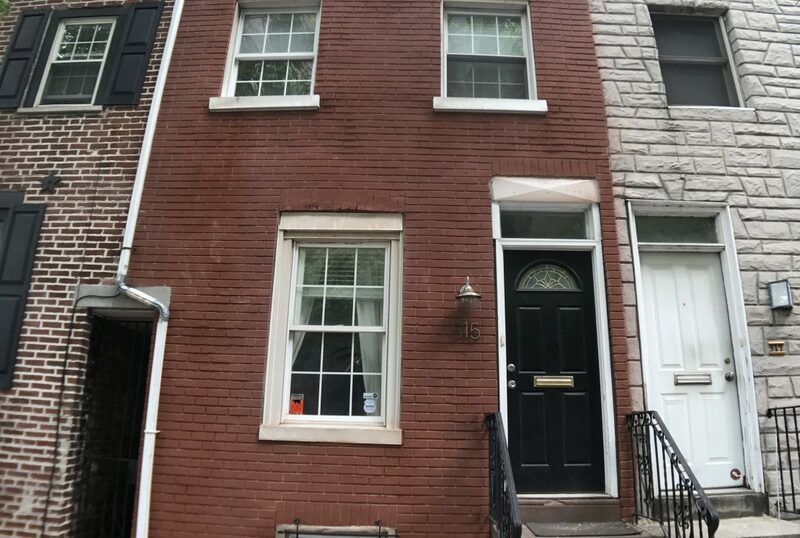 The exposed brick wall follows you up to the third floor which features another remodeled bathroom with full tub, as well as a bedroom with brick fireplace and a 3rd nice sized bedroom. Truly unique to this home for this area of the city is the 400+sf finished basement. Use this area as an entertainment area, child’s play room, or office. This room features recessed lighting, wall to wall sculpted carpeting, HDMI hook-up, flatscreen mount, built in entertainment shelving, enclosed laundry area, and ample storage. Convenient to Rittenhouse Square, UPenn, CHOP, Drexel, Fitler Square park, Taney Park, Graduate Hospital, Philadelphia Airport, and of course all of the restaurants, coffee shops, bars and overall neighborhood feel which makes Fitler Square one of the City’s most desirable neighborhoods.